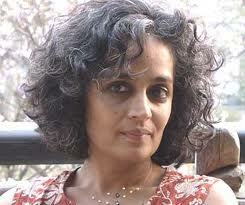 Arundhati Roy is an Indian novelist as well as a socio-political activist and hails from Kerala, southern India. The God of Small Things was Roy's first book. Completed in 1996, the book took four years to complete. The potential of the story was first recognized by Pankaj Mishra, an editor with HarperCollins, who sent it to three British publishers. Roy received 500,000 pounds in advance and rights to the book were sold in 21 countries. .The Ministry of Utmost Happiness transports us across a subcontinent on a journey of many years. It takes us deep into the lives of its gloriously rendered characters, each of them in search of a place of safety--in search of meaning, and of love. A braided narrative of astonishing force and originality, The Ministry of Utmost Happiness is at once a love story and a provocation--a novel as inventive as it is emotionally engaging. It is told with a whisper, in a shout, through joyous tears and sometimes with a bitter laugh. Its heroes, both present and departed, have been broken by the world we live in--and then mended by love. For this reason, they will never surrender.